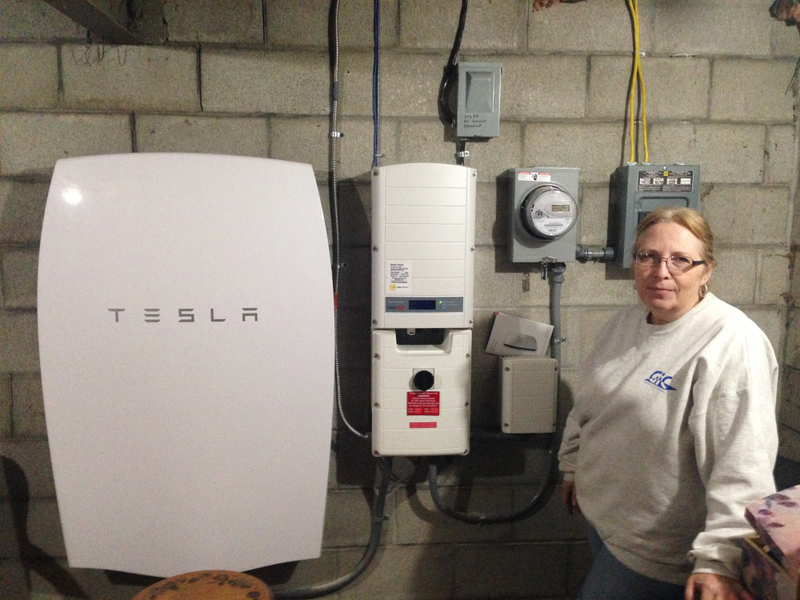 Associated Press/Dave Gram Rhonda "Honey" Phillips of Middletown Springs is one of the growing number of Green Mountain Power customers using the Tesla battery to store solar energy when her panels aren't collecting it. Rhonda “Honey” Phillips with a Tesla Powerwall battery and inverter connected to a solar panel array in her yard in Middletown Springs, Vt. Phillips is one of the growing number of Green Mountain Power customers using the Tesla battery to store solar energy when her panels aren’t collecting it. GMP has been working to link solar energy with battery storage on both a large and small scale.